Visit Isle of Wight’s summer campaign is off to a flying start. The press team have been busy arranging photo calls, promotional competitions and running around the Island delivering stamps and posters to attractions to ensure the successful launch of this summer’s central product – the ‘Time Traveller’s Passport’, a high quality booklet (taking the form of a passport!) which will be handed out to families as they make their ferry journey across to the Island. The Passport includes a list of attractions on the Island (‘Stamp Locations’) at which the passport holder can get his/her passport stamped. After collecting stamps, the Passport Holder must enter the codes they have collected (unique numbers which are incorporated into the stamp design) into the ‘Time Vault’ online at www.dinoisland.co.uk. When they have entered the codes they have collected (they only need one to participate), they will be notified of which prize they have received – prizes include tourist attraction tickets (kindly provided by Stamp Locations), free travel on and to the Island, cinema tickets, and the grand prize of a trip to Paramount Studios in Hollywood AND a holiday to the Isle of Wight. 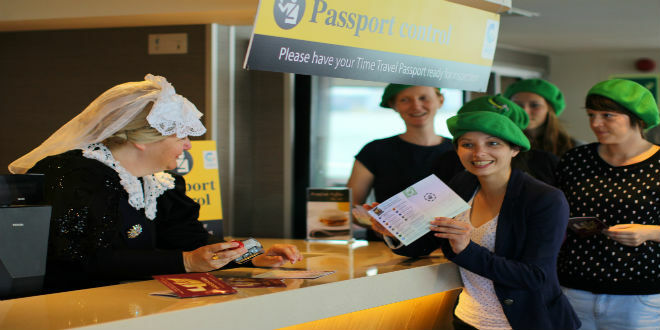 On Thursday, 10th July, a photo call was set up by the press team to signal the launch of the passport, where some of the Island’s most famous historical characters stepped on board the ferry to begin their journey through time. Queen Victoria took her position as a passport control officer and greeted travellers warmly as they collected their stamps. Other characters synonymous with the Island’s history including King Charles 1st and a Roman Centurion encouraged passengers to passport control to meet the queen. – Reisgids– We have just received a copy of a feature written about the Island following a press trip we organised last year for the Dutch journalist, Jeanette van Ditzhuijzen. Reisgids is a well-established magazine held in very high esteem by the Dutch, with a circulation of 50,000 and there were great mentions for Island attractions and accommodation providers who helped us to host this visit. – Fillers within Publications – As well as receiving coverage via large travel features, the press team often receives enquiries for fillers within publications. Recent examples include listings in Coast Magazine’s ‘Ten Things To Do This Month’ and on msn.com’s ‘The Best Island Restaurants in the UK’ feature. Msn.com receives over 200,000,000 visitors each month. Despite their low word count, listings such as these can have a great impact, especially when placed in publications/on websites with such a large readership. This type of information is always required “yesterday” so if we do e-mail you, please do try to respond ASAP. And thanks to everyone who responded to our request for accommodation etc for journalists visiting the Island over the next few weeks. We will keep you posted.